Indigenous art is performed by indigenous people that lived in a place long before other people came to live there. In South Africa this in particular refers to the San and Nama people. However, many cultures that are now considered indigenous to our country, although not in the same sense that the San and Nama were, brought their innate culture with them as they migrated towards the south from various places since the 16th century. In this sense Indigenous art also refers to home-grown art. Home-grown art then expresses the innate qualities that have developed and characterizes the different people of our land. Is an Indigenous African Arts Category necessary? 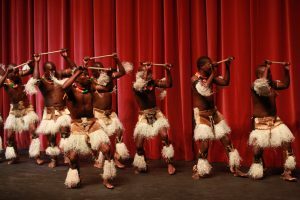 Following the success of the NEA Indigenous Arts Development Project with the support on the National Lottery Commission in 2015, it was decided to complete a new Indigenous South African Arts Section in Prospectus 2016. Given the challenges of the urbanization of people and urban influences, as well as the apparent low level of interest in performances in indigenous languages amongst the youth, it is important to find ways to promote and preserve indigenous arts practices so that people should know where they come from, where they are and where they are going. making it possible for young performers to discover themselves and to be aware of their latent talent.